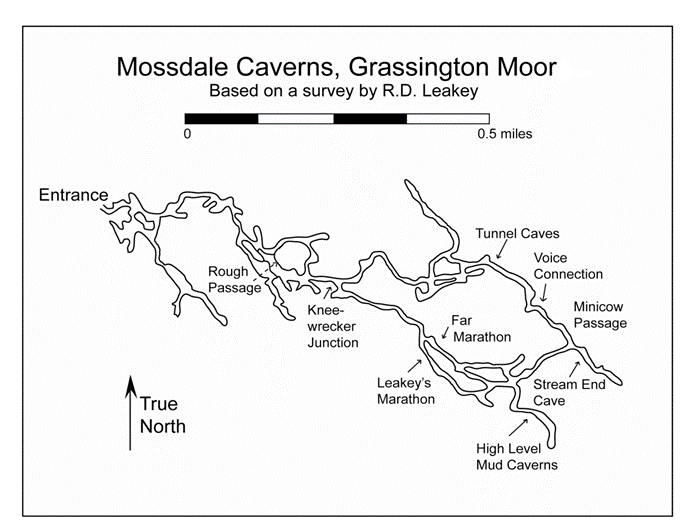 THE MOSSDALE TRAGEDY: by Mick Melvin In this introduction I have included the reasons why the British Speleological Association was drawn to the Area of Grassington Moor in 1939. I summarize early attempts to gain entry to the suspected Caverns by Bob Leakey and Eli Simpson. The arduous trips to the far end of the cave made by Mike Boon and Pete Livesey in 1963 are here in full, and the surveying of the known cave by members of the University of Leeds Speleological Association is covered. THE MOSSDALE TRAGEDY 1967 HISTORICAL BACKGROUND As the fiftieth anniversary of the Mossdale tragedy approaches, many people felt that a definitive record of Britain’s worst caving incident was required. For that reason I have gathered together material from many sources and my approach has generated divergent versions of events. As with most historical problems it is seldom possible to achieve a clear-cut response. The ambiguity that appears in some accounts is due to the significant passage of time since the tragedy. In what appear to be incompatible accounts of a single incident, every benefit of the doubt is given. This body of evidence will typically comprise what the primary sources; the people most involved in the rescue attempt, tell us about the disaster that occurred at Mossdale Caverns between 24th and 28th June 1967. CAVING IN THE MID-SIXTIES The years between 1964 and 1967 were an exciting time to be a caver in the north of England. During this period the Kingsdale Master Cave was discovered by the University of Leeds Speleological Association (ULSA). The Happy Wanderers extended Dale Barn Cave and Skirwith Cave, and Gingling Hole was extended by the Northern Pennine Club. After many hours in Langstroth Cave, cavers from a number of different clubs working together scaled the waterfall beyond the sumps, giving access into what became Langstroth Pot. In Mossdale Caverns, Mike Boon and Pete Livesey, on an epic trip, reached the end of the known cave twenty years after Bob Leakey’s solo trips. In doing so they postulated that a concerted effort at the end of the known cave might reveal further unexplored cave passages. CAVING EQUIPMENT 1960s The start of the 1960s saw the end of rope ladders and hemp rope lifelines. This heavy equipment was being replaced with nylon ropes, electron Ladders and compact wire rope belays. Electron ladders had been in use for some time with a few caving clubs, but in the 1950s most clubs were still using wooden rungs on rope ladders. During the early 1960s, nearly all caving clubs made their own ladders from Duralumin tube and wire rope. Neoprene wetsuits appeared on the caving scene; these too were mostly homemade using brown paper patterns and taped seams to keep them in one piece. Accumulator lamps strapped to your waist were replacing acetylene lamps, although in certain caves many preferred an acetylene lamp and a tin of carbide. Wellingtons began replacing boots as chosen footwear as they kept your feet dry for longer. Many cavers could now afford transport, mainly a motorbike. A good network of club hostels known as dumps, offered good facilities for a small fee regardless of whether you were a club member or not. For the most part, cavers, or potholers as they were referred to in Yorkshire and Lancashire, were content to don their gear and descend the abundance of caves in the northern Pennines with the objective of ‘bottoming” the cave and returning to the surface. On the other hand, there were many more cavers, for whom the appeal of caving was to dig, dive or blast, either in existing known caves or on the fells, with the intention of discovering unknown passages or previously undiscovered caves. These cavers can truly be called Cave Explorers. The six cavers who lost their lives in Mossdale Caverns in 1967 were unquestionably amongst the second group. On Saturday 24th June 1967 at two o’clock in the afternoon, a group of ten cavers, eight men and two women entered Mossdale Caverns near Grassington. They split into two separate groups before going into the cave. The first group into the cave comprised of Dave Adamson, Geoff Boireau, Bill Frakes, John Ogden, Michael Ryan and Colin Vickers, with the intention of going to the extreme end of the known cave and to use explosives to remove a blockage that had prevented further progress for a number of years. The second group, Jim Cunningham, Morag Forbes, John Shepherd, and Collette Lord, intended only to go as far as Rough Chamber, an underground journey taking about forty minutes, and then return to the surface. The second group completed their trip safely and exited the cave at five o’clock. By late afternoon weather conditions outside the cave had deteriorated quickly to thunderstorms, and heavy rain began to fall. The six cavers, who had gone to the far end of the cave and by now on their way out, were overtaken by a deluge of water which had flooded the cave as a result of the torrential rain falling on the fells above. Due to the quick thinking of Morag Forbes Dave Adamson’s fiancée, a major rescue attempt was set in motion by The Upper Wharfedale Fell Rescue Association. The story recounted below describes the subsequent rescue attempt through the voices of the people who took part in it. THE MOSSDALE TRAGEDY In the fifty years that have passed since the Mossdale tragedy, many words have been written about it in newspapers, journals, and books. In this piece, I have brought together an assemblage of voices to describe the events that led up to the Mossdale Caverns disaster and what took place at the cave during the days of 24th to 28th June 1967. I have included an account of the ensuing efforts which were made by the caving establishment to have the cave re-opened. It was proposed that in order to facilitate any future rescue attempt at the cave, the dam and Mossdale Beck diversion channel, which proved so successful during the 1967 rescue attempt be reinstated. Well informed individuals speculated; if this was done it would help prevent a repeat of the 1967 tragedy. I have gathered together material from many sources and included conflicting versions of events. I have made every effort to put forward the facts as they were submitted to me by the contributor. The ambiguity that appears in some accounts is due to the significant passage of time since the tragedy. In what appear to be incompatible accounts of a single incident, every benefit of the doubt is given. The entrance to Mossdale Caverns (NGR: SE 01628 69744) lies at the base of Mossdale Scar; an imposing crag attaining an altitude of 1400 ft. The crag stands in a shallow hanging valley walled by a steep grassy ridge on the south rising up to Grassington Moor, and a lofty fell on the north side, which extends beyond Conistone Moor to the summit of Great Whernside. Mossdale beck; which here has the proportions of a small river, sinks completely at the foot of the crag and is not seen again above ground until it emerges, together with the water from Langcliffe Pot, at the major resurgence of Black Keld (NGR: SD 97435 70984) on the east bank of the River Wharfe in the valley 750 feet below. The cave is approximately three miles from the village of Conistone in Upper Wharfedale; it is reached from there by a gated Landrover track (Bycliffe Road) used by shooting parties for many years. There is also a pleasant walk from Conistone which follows the valley of Conistone Dib before joining the Bycliffe Road after just less than a mile. Many people now prefer to approach the cave from Yarnbury where there is good parking. The walk is an easy upland stroll of three miles.